Is medical control of human aging a worthy goal? Despite the moisturisers you can buy it is impossible to reverse the damage of aging and very few of us will live to anywhere near the theoretical maximum of human age, estimated to be 125. Yet some people think the first person who will live substantially longer than this is alive today. 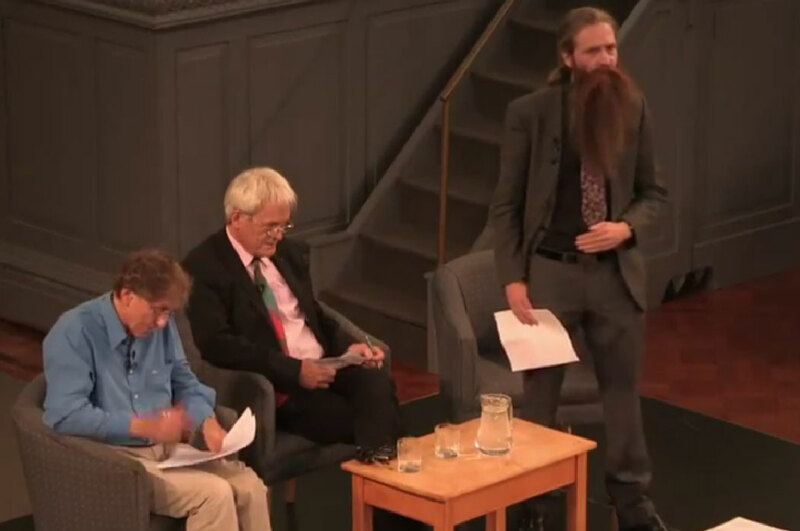 Aubrey de Grey is one of them. He was recently speaking at a debate at the Oxford University Scientific Society, for the motion “This house wants to defeat aging entirely.” De Grey is the chief scientific officer of the SENS foundation and a cheer leader for bringing aging under medical control. “This is no longer a radical heretical idea” he says; for de Grey defeating aging is at the heart what medicine is about. And when we treat aging, longevity is a welcome side effect. Methods to extend human lifespan are speculative and de Grey’s ideas are controversial. Calorie restriction is shown to increase the lifespan of several species, including rodents and fish, but there is no evidence that this will translate to humans. Nanomedicine is a futuristic strategy, with constant corporeal repair provided by microscopic robots. Another proposal is for cloning to generate cells, body parts, or even entire replacement bodies. De Grey is bullish about the future and the emergence of new technologies “if you tried to predict the rate of improvement in the Atlantic crossing by looking at ocean going liners you’d have been wrong” he says. Another of his proposals is of a “human longevity escape velocity” which supposes that initial life extension therapies will only grant a modest life extension. This extra lifespan will see a recipient through until the development of more advanced therapies. In this way the first person to live to 150 might also be first person to live to 1000. I find this reasonably persuasive. Colin Blakemore, professor of neuroscience at Oxford University, does not. He was speaking against de Grey. “Utterly unrealistic” is how he describes de Grey’s proposals and says that to defeat aging an “incredible range of age related disorders would have to be defeated.” He thinks that talk such as de Grey’s is a distraction from the real work of medical research. I agree. I don’t think that it’s inherently unethical to seek to extend human lifespan. It may actually be immoral not to do so as it denies future generations the chance of extended lives. Diseases of old age (which is most of them) kill 50 million people a year old worldwide and these will be preventable deaths like any other. But I am worried about the consequences. Even the prophets of life extension such as de Grey concede that, without a drop in birth rate, problems of rising population will become even more acute. We will need to choose between living longer and having children, as doing both will be catastrophic. As for my profession, I fear the emergence of life extending technology will divide the medical world. At present many doctors do not consider aging to be a “disease,” and it is therefore a questionable target for our attentions. Despite this objection, many doctors’ careers do not focus on acquired disease but on treating the consequences of age related decay. Either way, once we are able to arrest aging, life extension will be the only show in town. Population explosion and doctors’ objections aside, how else would living to 150, 300, or 1000 affect us and our societies? There are many potential pitfalls. Progress in many spheres—scientific, political, commercial—happens when its opponents die. Life extension will profoundly affect power structures as death will no longer serve as the ultimate solution to entrenched authority. If life extension were to be restricted to a wealthy few then this will further exacerbate our already deep social divisions. Perhaps most fundamentally, without a sense of urgency, what sense will we make of our lives? Will longer lifespan allow us to live all the lives we want, or will boredom overtake us leading to widespread demoralization? Maybe with so many more years to lose we will all become more careful with our bodies, reflective in our relations, and optimistic in our outlook. 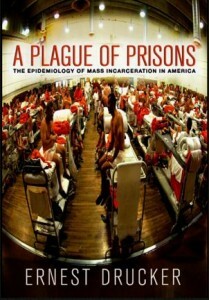 Can incarceration be thought of as disease? Among its many marvels, some things about the United States of America are stubbornly unfathomable. The persistent, widespread opposition to socialised medicine is one of them. And despite a murder rate impressive for all the wrong reasons, US gun laws remain unreformed. Add to this America’s prisons. This is not an area in which the United Kingdom basks in glory, but the American dedication to incarcerating its citizens remains without rival. “If this population had their own city, it would be the second largest in the country,” dryly remarks author Ernest Drucker. The numbers tell the story: of a population of 310 million, 7.3 million people are under the control of the US criminal justice system. Of these, 2.3 million are imprisoned, 800 000 are on parole, and 4.2 million are on probation. The US has 5% of the world’s people but 25% of its prisoners. This section of the US population grew fivefold between 1970 and 2009. Drucker, an epidemiologist, sees this increase as a plague and amenable to examination using the tools of his trade. Although imprisonment is not usually considered a disease, this framing isn’t meant to be metaphorical. The American fondness for imprisoning its citizens meets all the key criteria for an epidemic: its growth rate is rapid, its scale large, and it shows self sustaining properties. During London’s 1854 outbreak of cholera, John Snow’s insight famously led to the removal of the handle of the Broad Street water pump. Soho’s residents could no longer drink its contaminated water. What is the pump filling America’s prisons, and is it possible for the handle to be removed? Drucker shows how in one state­­—New York—the rate of incarceration clearly surged from the 1970s. This coincides with the introduction of the state’s so called Rockefeller drug laws: punitive legislation introduced in response to a rise in heroin use in the 1960s. These laws made it possible for those caught in possession of even small amounts of illegal drugs to receive the same sentences as imposed for violent crime. Similar legislation would be enacted throughout the country. Most of New York City’s prison population comes from just six neighbourhoods. This echoes the distribution of deaths on the Titanic, which reveal the rigid social structure of the Edwardian era. On the Titanic, those in the highest social class were more than twice as likely to survive as those in the lowest social class. In New York some areas are plunged into near anarchy by the so called war on drugs being waged on their streets, while others are almost untouched. Incarceration also causes disability, just like disease, and is passed on to future generations, just like disease. The children of families where a member is incarcerated have a lower life expectancy and are six to seven times more likely to go to prison themselves. The notion of applying an analysis to social problems that is more conventionally used to understand disease has gained recent cultural currency. The Interrupters, a 2011 feature length documentary, focused on CeaseFire, a Chicago antiviolence programme that deploys street workers as mediators between factions during incipient street conflict. It was founded by Gary Slutkin, another US epidemiologist, who considers violence to be primarily a public health issue. Slutkin has publicly encouraged David Cameron to adopt CeaseFire’s approach in London. Something must be done about prisons, but is this the way ahead? Labelling people as victims of a plague has never been a good way to rehabilitate them back into society. No matter how neatly it may fit a disease model, bringing epidemiological theory to bear on the problem of prisons reframes that problem as something dispassionate and treatable, when in fact it is intensely political. Drug laws may be America’s prison pump but behind those laws lies the willingness of lawmakers and politicians to treat marginalised groups and their problems within a punitive criminal justice framework. If drug laws are reformed then opprobrium for other misdemeanours may take their place. Some US schools now use police to enforce school discipline, for example, and increasing numbers of children are being convicted via this route. This criticism is unacknowledged by Drucker, but to his credit, the public health response he offers to high levels of incarceration is more radical than might be expected. It’s no surprise that he writes that, as primary prevention, drug laws like the Rockefeller laws have to go. Secondary prevention involves prison reform. But as tertiary prevention, and to address the “great task of healing to be done on both sides of crime and punishment,” he proposes a programme of restorative justice in a shape of a formal peace process, not unlike South Africa’s Truth and Reconciliation Commission. In a time when public inquiries are not in short supply, it’s easy to be cynical about such a suggestion, as it is about Drucker’s approach in general. But this book is accessible and persuasive. Prisons on both sides of the Atlantic represent an immense waste of human potential and financial resources. The questions of what to do about them need to be asked more often. This analysis has much relevance beyond US borders; British incarceration rates are lower, but the UK has one of the highest rates of imprisonment in Europe. Successive recent governments have presided over a steadily increasing UK prison population that has doubled in 20 years. This “one in four” figure has also appeared in government speeches(1) and NHS publications. (2) It is the name of a short film and the title of a mental health magazine. Yet it is not always clear to what the figure refers. Time to Change seems to be referring to lifetime prevalence, while a 2010 advertising campaign by Islington Primary Care Trust stated, “One in four people will experience mental health problems each year.” A statement on the Royal College of Psychiatrists’ website reads, “One in four people has a mental health problem,” implying point prevalence. We are unaware of any evidence that straightforwardly supports a UK lifetime prevalence of 25%. The APMS past week prevalence most robustly supports one in four as a statement of the UK’s 12 month prevalence,(7) but in this case the UK lifetime prevalence would be expected to be much higher. A 2005 meta-analysis estimated a yearly prevalence of 27% for the European Union (including the UK),(9) but a 2010 update of this work revised this to 38% a year,10 as a result of including more disorders such as insomnia and attention-deficit/hyperactivity disorder. This highlights the fact that over the years the consensus on what constitutes mental disorder has often changed. Different population surveys adopt different definitions, and there is no agreement about whether to treat, for example, a phobia such as arachnophobia as “mental illness.” No major study has considered nicotine dependence or male erectile disorder in their calculations, despite these disorders being widespread and listed in the fourth edition of the Diagnostic and Statistical Manual of Mental Disorders (DSM-IV). Nicotine dependence is perhaps responsible for more deaths than any other psychiatric disorder. Furthermore, surveys such as the APMS establish diagnosis in a very different way from how it is discerned clinically. In the clinic, a doctor works from a patient’s presenting complaint, through their history, and on to mental state examination. By contrast the APMS recruited a large representative sample and used a structured diagnostic interview to screen each participant for a range of disorders. Structured interviews involve a patient answering a fixed series of questions taken from published criteria. Systematic checking of a symptom inventory in this way lacks the benefit of clinical judgment and simultaneously creates a risk of both over-diagnosis and under-diagnosis. Taken literally, the DSM-IV criteria for major depressive disorder would deem many people depressed after bereavement or the end of a relationship. Conversely, a patient’s imperfect recall or lack of insight into their own psychopathology could lead to under-reporting. Despite these drawbacks, why has this figure proved so popular? We would like to suggest some reasons. Demonstrating relevance: For journalists, quoting a high prevalence of mental disorder helps illustrate the newsworthiness of stories about mental health. Fighting stigma: The one in four statistic has been used extensively by charities to advocate the interests of people with mental illness. Much of their recent campaigning has focused on attempting to combat stigma and prejudice through providing a more inclusive vision of mental disorder—one in which it is nothing unusual and a threat to everyone. Not too big, not too small: If the intent is to raise awareness of the burden of mental illness, why do organisations not cite the even higher, and better supported, figures of one in three or one in two lifetime prevalence? We suggest that one in four is high enough to gain people’s attention but not so high that it provokes incredulity, as claims that over 50% of people have had a mental illness indeed have. The one in four figure for mental illness prevalence is widely quoted, related variously to lifetime, yearly, or point prevalence. The evidence indicates that it is best supported as an estimate of yearly prevalence. However, estimates of the population prevalence of mental disorder should be approached with caution, as the methods used often have shortcomings. It is important that people know that mental illness is common and that treatment of mental disorder is essential, but it is not clear that championing a poorly supported prevalence figure is the way to achieve this. Johnson A. Psychological therapies in the NHS: science, practice and policy (speech to the New Savoy Partnership Annual Conference). Department of Health, 2008. Tavistock and Portman NHS Foundation Trust. Mental health myths. 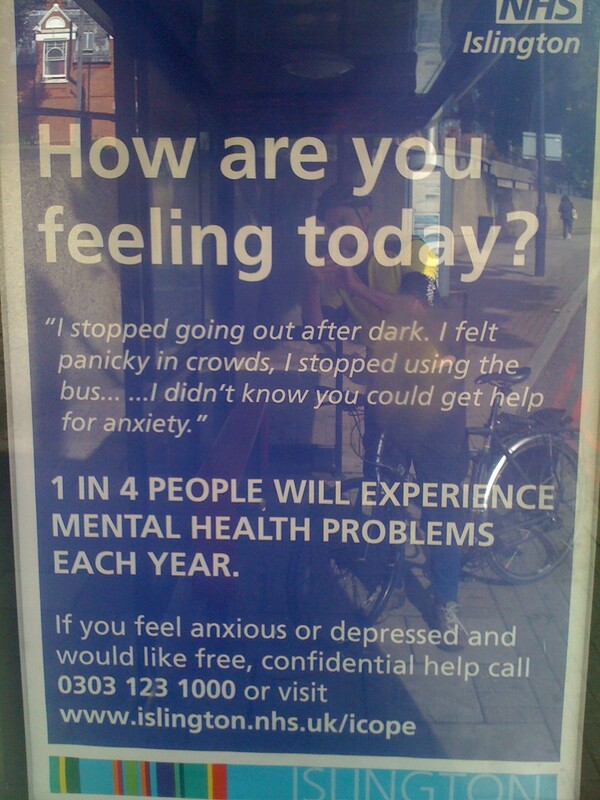 2011. www.tavistockandportman.nhs.uk/mentalhealth/myths. World Health Organization. Mental health: new understanding, new hope. WHO, 2001:23. Regier DA, Boyd JH, Burke JD Jr, Rae DS, Myers JK, Kramer M. One-month prevalence of mental disorders in the United States. Based on five epidemiologic catchment area sites. Arch Gen Psychiatry1988;45:977-86. Wells JE, Bushnell JA, Hornblow AR, Joyce PR, Oakley-Browne MA. Christchurch psychiatric epidemiology study, part I: methodology and lifetime prevalence for specific psychiatric disorders. Aust N Z J Psychiatry1989;23:315-26. Almeida-Filho, Mari Jde J, Coutinho E, França JF, Fernandes J, Andreoli SB, et al. Brazilian multicentric study of psychiatric morbidity: methodological features and prevalence estimates. Br J Psychiatry1997;171:524-9. Weich S, Brugha T, King M, McManus S, Bebbington P, Jenkins R, et al. Mental well-being and mental illness: findings from the adult psychiatric morbidity survey for England 2007. Br J Psychiatry2011;199:23-8. Kessler, Chiu WT, Demler O, Merikangas KR, Walters EE. Prevalence, severity, and comorbidity of 12-month DSM-IV disorders in the national comorbidity survey replication. Arch Gen Psychiatry2005;62:617-27. Wittchen HU, Jacobi F. Size and burden of mental disorders in Europe: a critical review and appraisal of 27 studies. Eur Neuropsychopharmacol2005;15:357-76. Wittchen HU, Jacobi F, Rehm J, Gustavsson A, Svensson M, Jönsson B, et al. The size and burden of mental disorders and other disorders of the brain in Europe 2010. Eur Neuropsychopharmacol2011;21:655-79. Roberto Casula studied at Padua medical school in Italy, graduating in 1989. He came to the UK in 1993 and has worked in Glasgow, Cambridge, and London. He has a European qualification in cardiac and thoracic surgery and is a fellow of the Royal College of Surgeons. He is a consultant cardiothoracic surgeon and honorary senior lecturer at Imperial College London and a UK pioneer of minimal access and robotic cardiac surgery. What first attracted you to cardiac surgery? As a child I was told about the first heart transplant. This never left my mind and I was fascinated by the whole story. Since then I never considered any other path in life apart from studying medicine and then training in cardiac surgery. What do you value about your job? You hear about successful people being bored with their highly remunerated job after 10 years. I don’t think that this will happen in a specialty like mine. The technical improvements and technological refinements in cardiac surgery continue to stimulate me and remain challenging on a daily basis. It is also rewarding to see that we can provide somebody’s problems with a solution and hear from them about how much they have improved after surgery and minimal invasive procedures. What’s different about cardiac surgery compared with other sorts of surgery? Dealing with the heart is challenging and fascinating: having to stop it and then restart it and—even more challenging—sometimes having to operate it while it’s moving. Performing microsurgery on a beating heart requires dexterity and skills that have developed in cardiac surgery to a high level. There are days when I spend most of the time in the operating theatre. This is usually physically demanding. In a day I typically do one, two, or three operations and I often organise my meetings and do paperwork in between cases. Some days I attend multidisciplinary team meetings or see outpatients. Regardless of the extensive use of technology in my clinical practice I enjoy talking and listening to my [out] patients because it allows me to ensure they continue to progress to our expectations. I also spend some of my time reading, reviewing, or writing academic papers. 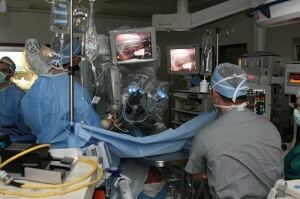 What does robotic enhanced minimal access surgery involve? When we say “robotic enhanced” obviously it is not an independent intelligence that performs the operation. The system is guided by a surgeon, and moves pencil sized surgical effectors inside the chest that are positioned at the beginning of the operation. The operation takes place through small incisions. This avoids opening the sternum, which is always required with traditional surgery, and this is what we mean by “minimal access.” The advantage is that we can reproduce traditional surgical techniques with reduced surgical trauma. We also do not use the cardiopulmonary bypass machine, and therefore we do not expose these patients to side effects [associated with the machine]. Usually patients treated with less invasive or robotic surgical techniques recover faster and return to their normal daily and professional activities sooner than the traditional patient. What sort of operations are you doing using these techniques that other people are doing via traditional surgery? The most common operation performed with robotic technology is a single bypass to a blocked coronary artery. We also undertake mitral valve repairs. Several other minimal access procedures are routinely performed to change or repair the aortic valve, remove heart tumours, or reset the normal sinus rhythm in patients with atrial fibrillation. These do not necessarily require robotic technology. Why are so few surgeons offering robotic cardiac surgery in the UK? The techniques are time consuming and require specific training. The set of skills needed for robotic surgery are different from those acquired when training for traditional cardiac surgery. Another limitation is that several medical specialties offer treatments for cardiac disease. As a result, we don’t treat a sufficient number of patients surgically to reproduce robotic technology in large volumes. What’s the best way to choose the most appropriate treatment for a patient with a cardiac problem? In an ideal world the specialists discussing the case would be a conventional cardiologist who can do an angioplasty, a non-interventional cardiologist who is untrained in either angioplasty or robotic surgery, and a cardiac surgeon capable of performing minimal access/invasive surgery. This is what is suggested by European guidelines. Between the three of them they will be able to reach the best decision for the patient. What innovations do you think we’ll see in cardiac surgery in the future? I would like to see better integration between present technologies with better collaboration between groups of specialists. The best treatment is “hybrid treatment,” which means being able to offer a bespoke treatment to a patient according to his or her needs. An example of this might be a patient with multivessel coronary artery disease who has a robotic operation on the most important vessel, such as the left anterior descending, and angioplasty to a further vessel of lesser importance. What advice would you give a student thinking of training to be a cardiac surgeon? The best approach is to arrange to visit an operating room and watch an operation. If possible they should also see a minimal access operation, and perhaps even a robotic operation. If they are caught by this bug that caught me many years ago I think they will never regret entering into a career in cardiac surgery. 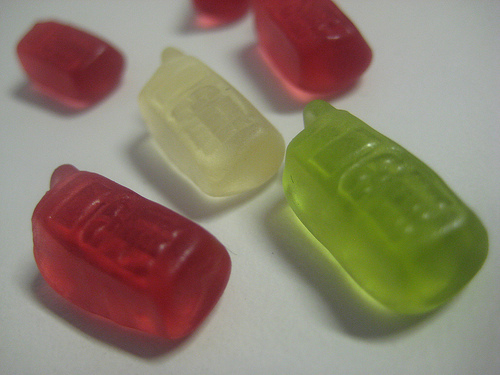 I learnt some interesting facts about mobile phones the other day. For instance, there are 59 countries where mobile phones outnumber people. This refers to mobile phones actually in use, rather than forgotten ones in drawers, under sofas, or in the glove compartment of your car. Worldwide there are six trillion texts sent a day, about which unexceptional Western teens are exceptionally keen as they send/receive an impressive 3,400 per month. The average user of a mobile phone looks at it 150 times a day. That’s every 6 minutes 30 seconds. We’ve known for while that mobile phones, and their newer, cleverer brethren “smart phones” are really going places. They’ve become essential to our lives, supplanting other objects in our affections, as observed (tearfully?) by Jeff Hazlett, former CMO of Kodak. Even a fairly humdrum smart phone now packs a terrific amount of computing power. Beyond making voice calls the initial uses of these phones were fairly unimaginative. Since then a combination of advancing phone functionality and imaginative third party “apps” points to a future where mobile phones are not only ubiquitous but will be increasingly relied upon to help us to interact with, and make sense of, the world. They also have a potential to substantially alter the practice and potential of healthcare. Key to this transformation is that smart phones can interact with the world around them. The first generation of mobile phones received input solely through a keypad. Today, just like me, my phone can see and hear, and can detect motion and direction. Using an app like Layar I can overlay digital information onto my phone’s field of vision. Using SoundHound, it can tell me which song is playing on the radio. My maps app means I never get lost. So far, so useful, but my phone can also communicate with other devices wirelessly–something that exceeds my human capabilities. This is already allowing smart phones to subsume the function of a credit card or a set of keys. Using the same technology in the near future the world has the potential to become an “internet of things,” a huge network of interconnected devices. Imagine your ever smarter handset telling you that you have a window left open at home and asking you whether you wish to switch off your heating, or reminding you that your car is short on fuel. From here it’s almost no leap at to see a patient with coeliac disease scanning every item in a supermarket before purchase to ensure it’s compatible with their diet. Or to imagine a world where wearable sensors, that will allow us to routinely monitor our well-being, are commonplace. If your heart beat rises unexpectedly, your phone will ask you if you’re stressed and advise you to take a break. In many ways this all sounds fantastic, as it offers opportunities for the early detection of disease and for promotion of healthy living. I’m not sure I personally welcome a coming world where my phone moonlights as my super-ego, or where my body is viewed as simply being a more intimate extension of my social network. However even I can see it would be useful if my running shoes could tell me when they’re worn out. 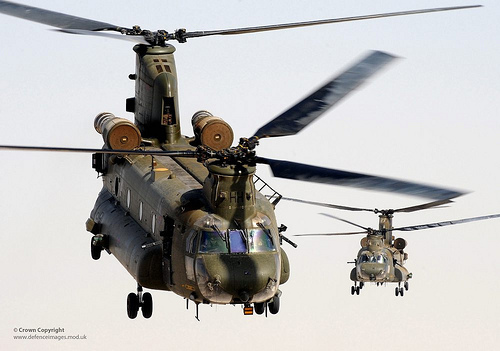 War may not be good for much, but it has proved to be an effective incubator for innovation. I’m not just talking about the Slinky: the development of nylon, polythene, and aerosol sprays also benefitted from conflict. The urgency of war has also lead to many of the most important innovations in medicine. It was the battlefield surgeon Ambroise Paré who in the 16th century introduced the ligature of arteries (instead of cauterization) during amputation. An effective treatment for leukaemia emerged from nitrogen mustard’s use as a poisonous gas and Dwight Harken operated on wounded D-Day soldiers and demonstrated that shrapnel could successfully be removed via open surgery to the heart. A recent Royal College of Surgeon’s event, “Disability and the military,” discussed medical progress emerging from more recent conflicts. Most notably the chance of surviving an injury during combat is now much improved. During the Second World War wounded soldiers had a one in three chance of dying. Today this figure in Afghanistan is less than one in ten. Speaking at the event orthopaedic registrar Major Arul Ramasamy attributes this improvement to a variety of factors. Body armour plays an important role, as have improved helmets and ocular protection. The “continuum of care” is also vital. Treatment now starts the moment an injury is sustained, as all deployed troops are trained in battlefield first aid and carry tourniquets and haemostatic dressings. “We’re bringing some of the stuff that was always left to the hospital out to the battlefield,” said Major Ramasamy. The injured are evacuated quickly and soldiers receive medical attention, including blood transfusions, on the evacuation helicopter. On arrival at Camp Bastion the team aim for rapid surgical decision making. “The fastest time I’ve seen from a patient arriving to them being operated on is 45 seconds” said Major Ramasamy. To a psychiatrist like me, even thinking about this sort of speed makes my head swim. Soldiers are now living with injuries that five years ago were considered unsurvivable, such as the loss of two or even three limbs. This brings its own challenges and physically surviving such injuries is only the beginning of a long period of recovery. Much of the provision for long term rehabilitation comes from the charitable sector with the Royal British Legion and Help for Heroes providing facilities such as Tedworth House. Colonel Richmond was keen to stress that injured soldiers are capable of much, including outdoor activities, and that one of the challenges of rehabilitation is persuading them of this. It remains to be seen how far the advances in treating battlefield injuries will translate into improved civilian trauma treatment as the advanced continuum of care the military can offer is unlikely to be replicable on civvy street. Few civilian casualties, for instance, find themselves injured whilst standing next to friend trained in first aid. Established on 15 October outside St Paul’s and watched over by a statue of Queen Victoria, the Occupy London Stock Exchange (LSX) camp continues its controversial settlement in central London. Paul, a doctor whose day job is as a sexual health specialist in South London, shows me around. For a movement with no apparent leadership, lurking somewhere must nevertheless be an effective organising team. The camp is clean and alongside the accommodation are larger tents with information, welfare, first-aid, and “university” roles. Paul tells me of the chaotic establishment of the camp: “The police were stopping us from going into Paternoster Square,” he says. Corralled, the protestors’ current spot was chosen by default. “There were a lot of police,” he continues. “When I woke up in the morning, I was really surprised we were still here.” The police eventually withdrew the following morning. We drop into the university tent where Professor Ted Honderich, UCL professor emeritus of the philosophy of mind and logic, is hosting a discussion; an erudite debate is underway concerning the nature of capitalism. Immediately outside the disparate aims of the Occupy movement are clear from the posters that now adorn the pillars facing M&S on the north side of the camp. 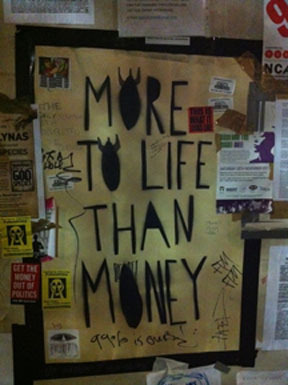 “More to life than money,” reads one, whilst others variously call for defence of public services, Julian Assange’s release, as well as more niche concerns. Defending the NHS is a motivating factor for some protestors for whom the recent takeover of Hinchingbrooke hospital by Circle augurs future unacceptable developments. David stays in the camp, doing his job remotely via a laptop from the nearby Starbucks. He’s also first aid trained and works shifts in the camp’s first aid tent. “I’m here to put pressure on the government to look seriously at the Robin Hood (aka Tobin) tax,” he says. “I’m concerned about the cuts in public services and especially the NHS.” He sees the Tobin tax as avoiding cuts that would otherwise be inevitable. As a consequence, a welfare tent was established with the involvement of two consultant psychiatrists. Paul says this required some consideration. “There was part of me that said we are not about caring for people, we’re here for a political purpose,” he says. The welfare tent’s presence is not entirely altruistic to my mind. The camp’s continued existence remains precarious, and a responsible, civic-minded community is harder to demonise and evict. Asides medical involvement in the welfare tent, a medical team also wrote a report on site safety, hygiene, and sanitation. In Starbucks I meet Simon, a part time nurse also involved with the first aid tent. A target at past protests, Starbucks is in fact warmly regarded by all I meet at Occupy LSX. As well as Occupy’s de facto common room, early on the café allowed the protestors use their toilet before alternative portable ones were sourced. “We do have two facets to the organisation. There’s the progressive widespread attempt to verbalise certain issues and get them fed into the media, and then there’s the occupation and the collaboration of people living together and trying to maintain a site,” says Simon. By chance at an Arab Spring protest earlier in the year, Simon had been impressed by the protestor’s medical facilities and sought to bring similar facilities to Occupy LSX. What I hear the loudest from the protestors is that Occupy LSX is about creating a space for people to articulate arguments about the government’s economic policy and its consequences: unemployment, increasingly expensive education, and the privatisation of the NHS. The vague sense of unease many of us feel is here, amplified and expressed. But I’m inclined to be generous. Expecting protestors to have a fully developed alternative before they raise their voices represents an unrealistically high expectation. But whatever I think, they have no inclination to pack up their tents yet. At the time of writing a third camp is forming in an abandoned UBS building in the City. Some names and identifying details in this post are changed by request. Inglis contends that the BMJ’s print run and thus carbon footprint can be reduced by a combination of increased reader sharing of print issues and greater embrace of digital distribution. The whole picture is less straightforward. The BMJ is a commercial publication, albeit not an aggressively capitalist one, and it must pay its way. Part of its funding comes from print advertising, and advertisers remain reluctant to pay for online and iPad advertisements. Were the BMJ to make the transition to an online only publication, with most printed copies communally read in institutions, its business could prove unsustainable. “So what?” some might say, but unexamined healthcare is also wasteful inefficient healthcare. The idea that a move from printed to digital distribution will automatically lower the BMJ’s carbon footprint is not a foregone conclusion. At least one comparison of the environmental impact of print, online, and tablet based consumption has been attempted and comes out only hesitantly for tablets. A comparison of print and digital distribution must include all stages. A digital journal is free from the physical print and distribution costs of a print journal but data storage—“cloud computing”—and device manufacture/disposal must be considered. Greenpeace’s recent report on cloud computing data centres voices concern that many rely on “cheap but dirty” coal power stations. Ultimately many factors determining an electronic journal’s environmental impact are down to reader behaviour. The fewer tablets, laptops, and smart phones we buy the lower our carbon footprint. Yet most of us own several devices with overlapping functionality, which we regularly replace. Few of us switch them off as often as we should. 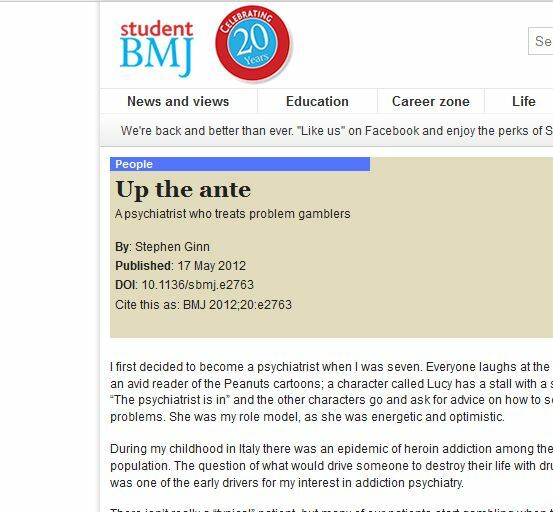 Competing interests: SG is employed by the BMJ as editorial registrar. Identifying mental illness in historical figures is a favourite hobby of psychiatric sleuths. Particular scrutiny has been paid to the lives of painter Vincent van Gogh and composer Robert Schumann. Both spent time in asylums, but their correct diagnoses remain in dispute. Similarly, descriptions of symptoms of mental disorder have been identified in creative works dating as far back as Shakespeare in the 16th and 17th centuries and the playwright Sophocles in ancient Greece. Until recently depiction of mental disorders in comics (also known as graphic novels) has attracted less interest. This may be because of their historic association with younger readers, but comics are now read by people of all ages and are gaining more attention, particularly in healthcare. Long running series such as Batman have multiple characters who display symptoms of mental disorder, and works such as Couch Fiction and Psychiatric Tales have storylines specifically about mental health issues. Looking at the psychopathology of comic book characters is an interesting diagnostic challenge and also a newly used approach to medical education. A comic book convention earlier this year was held to educate the public about psychiatric conditions. Various comics were studied, with Batman being heavily scrutinised. Mental illness is ubiquitous in Batman’s Gotham city. “Over the years, the stories of the Batman comics have been intensely psychological,” says psychologist, writer, and visiting senior research fellow at the Institute of Psychiatry, Vaughan Bell. The longevity and popularity of Batman comics and films make it one of the best known representations of mental illness. Arkham Asylum, Gotham’s sanatorium for the “criminally insane,” towers both literally and metaphorically over the city. Many of Batman’s adversaries have either escaped from there, or are destined to return there. The personas of Batman and his arch enemy the Joker are both trauma-induced. Batman’s crusade against crime begins with witnessing the death of his parents. The Joker becomes a villain when, as told in The Killing Joke, he falls into a toxic river shortly after the death of his wife. Batman’s response to his traumatic experience is to become a masked vigilante. Objectively this is unusual behaviour, but not in Gotham city, where spandex-clad criminals are the norm. In contrast, the Joker is unable to show such a “mature” response and turns to crime. Both can be considered madness owing to trauma. Harley Quinn is an example of a disturbed psychiatrist, although her presentation has little resemblance to an established psychiatric disorder. Quinn, originally Dr Harleen Quinzel, is an Arkham psychiatric intern who becomes fascinated with the Joker and offers to psychoanalyse him. During treatment, the Joker’s influence causes her to abandon her previous life and personality. She falls in love with him and helps him escape on several occasions. The portrayals of mental disorder in the Batman characters such as the Joker and Harley Quinn are often highly inaccurate. This has been of interest to American psychiatrists Eric Bender, Praveen Kambam, and Vasilis Pozios. “In the real world we don’t necessarily see someone either becoming a hero or a villain following a single traumatic event,” says Dr Bender, questioning the verisimilitude of the back stories of Batman and the Joker. Dr Bender also says that the term “criminally insane,” although liberally used in the Batman stories, is not a term that is used either legally or in psychiatry. Batman storylines often combine syndromes, and sometimes the use of terminology is just plain incorrect. “The Joker is the character who is most commonly referred to as ‘psychotic’,” says Dr Kambam, “but in over 70 years of stories you’d be hard pressed to find evidence of actual psychosis depicted.” Classically, the definition of psychosis is a mental state seen in serious mental disorders such as schizophrenia, when a patient has disorganised behaviour and thinking. “What the Joker actually displays more of is psychopathic traits,” says Dr Kambam. Psychopathic traits include manipulativeness and a lack of empathy. Drs Bender, Kambam and Pozios are using the depictions of mental states in Batman as a way to talk to the general public about psychiatric disorders. The histories of comic book characters are well known and, unlike other public figures, can be discussed without fear of impropriety. Pioneering this form of medical education, they held a seminar at Comic Con, a large comic convention held in San Diego in July 2011. “We looked at whether the character of Bruce Wayne [Batman] displays any symptoms of post-traumatic stress disorder (PTSD) in the film Batman Begins,” says Dr Pozios. During the seminar they explored the nature of PTSD and the challenges in making a diagnosis. They felt that Batman had symptoms of PTSD but does not meet the full diagnostic criteria. Audience questions also provided an opportunity to correct misperceptions. One audience question was, “If Batman doesn’t have PTSD then is it better to say that he has schizophrenia?” This refers to the common misunderstanding that schizophrenia means split personality. “That’s not correct,” says Dr Bender, “schizophrenia is a psychotic illness.” PTSD is an anxiety disorder. Many other comic book characters are amenable to psychiatric scrutiny. Could we diagnose the Hulk with an impulse control disorder? And how has Superman been affected by being the last survivor of his planet? “The handling of mental disorder is particularly effective in The Long Road Home by G B Trudeau,” says Dr Williams. G B Trudeau draws the well known newspaper comic strip Doonesbury. In The Long Road Home he examines the life of a Doonesbury character following active duty in Iraq. “The comic documents how the character’s life changes after he loses a limb traumatically,” says Dr Williams. “The author spent time in rehabilitation centres in order to make the approach more realistic.” The character develops PTSD, becomes withdrawn, and has constant flashbacks. Dr Williams also recommends Psychiatric Tales. This is a collection of 11 strips about psychiatric illness, which was published to acclaim in 2010. Its author, Darryl Cunningham, worked as a healthcare assistant on psychiatric wards and also had his own problems with mental illness. Comics are very accessible as they are quick and easy to read. Their ability to juxtapose image and text means that they are a rich medium for both storytelling and documenting. Established comics such as Batman have featured mental disorder for many years. Although the characters’ disorders in Batman often display a high degree of artistic licence, they can still be used as a teaching aid and may engage an audience who would otherwise lack interest. Non-fiction comics such as Psychiatric Tales are often more realistic and can provide us with valuable insights into the lives of psychiatric patients.